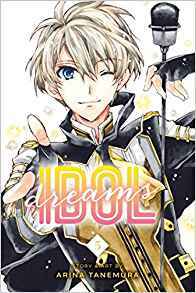 Idol Dreams is a fun, if a bit uneven, soapy series about a repressed office lady reliving her youth in the best way by occasionally taking magic pills that turn her into a teenage aspiring teen idol singer! People fall in and out of love and deal with show business shenanigans, but will Chikage’s teenage adventures translate into any newfound maturity in the real world? Indications in this fifth volume are promising! Chikage is much more assertive and resourceful in her teen idol persona as Akari. She’s trying to gain more recognition through a sing-off battle and manages to dodge a series of mean girl attacks and come out on the other side victorious even though she’s just a slightly better known aspiring idol singer. One of the things I’ve been wondering about is when Chikage’s old classmate and magical teen pill supplier Tokita was going to get a bit more focus, because so far he seems to be mainly pining in silence. My patience was rewarded with this volume, as it focuses on him. The real world is much more complex than teen idolland, as Chikage learns that Hanami who one of her workplace mean girls is also Tokita’s girlfriend, and she’s been cheating on him. Chikage is able to stick up for Tokita in a way that she’s never managed for herself, but she doesn’t realize what her own feelings are for Tokita until it is far too late. There is more time spent on the characters’ backstory in this volume, especially Tokita, which was a nice change of pace. I’m a bit worried that Chikage is going to bury herself in her teen persona in the next volume to distract herself from her pain as an adult. It is all breezy fun although I’m slightly terrified about what might happen with Akari and Hibiki. I think that the series would also seem a bit less disjointed if I was reading it all with less time in between volumes, where the quick pace of people falling in and out of love might be less noticeable in a larger chunk of story. Still, I’m always up for an Arina Tanemura manga, and I’m hoping that Chikage becomes a more self-assured woman by the end of the series, and I’m glad that she’s showing some signs of assertiveness, even though she still needs more self-awareness to match.